8. Create cone using Adobe Illustrator - The fluorescence laboratory. 1. Create a new layer called Cone. Hide all other layers but the background. 2. Select the Line Segment Tool and make a white line with weight 2 pt. Set its opacity to 65 %. 3. While the line is selected, go to Effect -> 3D -> Revolve. 5. Make a copy of the cone, Ctrl+C, Ctrl+V. 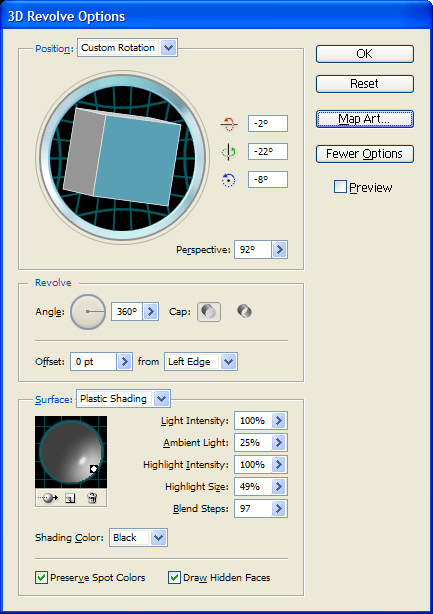 Select the new cone, go to the Appearance panel to the right and click on 3D Revolve. 6. In the Revolve dialog box, set the Surface type to Wireframe instead of Plastic Shading. 7. Press OK and move the new cone to the center of the first cone. Set the opacity of the new cone to 38%. 8. Create an arrow using the Line Segment Tools. Set the arrowhead to 80% and the line Weight to 2 pt in the Stroke panel to the right. 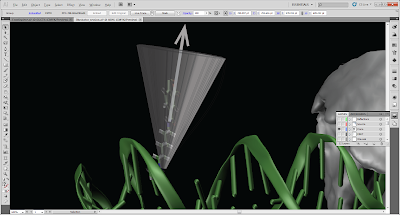 Set the opacity of the arrow to 75% and position it in the middle of the cone.